JETHRO TULL-HEAVY HORSES (NEW SHOES EDITION). Jethro Tull-Heavy Horses-(New Shoes Edition). As April 1978 dawned, Jethro Tull was still one of the most successful British bands of their generation, and were about to release their eleventh album Heavy Horses, which was the second album in a trilogy of folk rock albums. 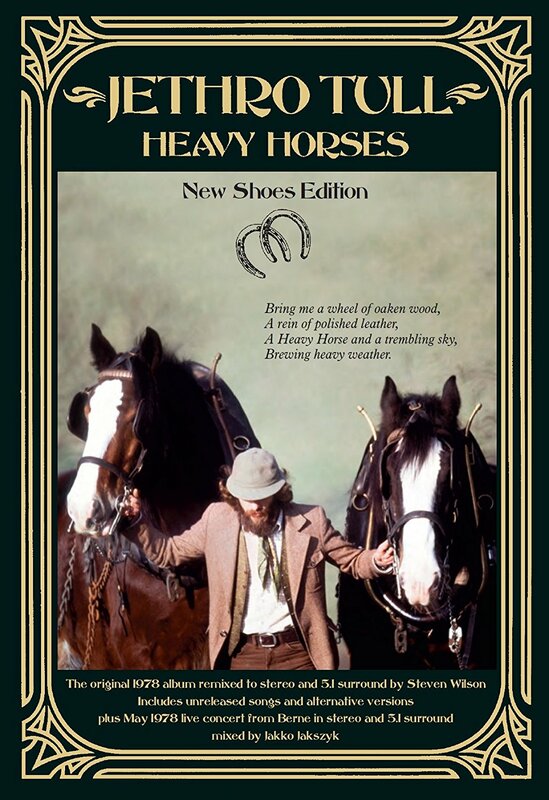 Jethro Tull hoped that Heavy Horses, which was recently reissued by PLG UK Catalog as a five CD box set entitled the New Shoes Edition, would build on the success of Songs From The Wood which had been released in February 1977. It was the first instalment in Jethro Tull’s folk rock trilogy, which was a new chapter in their career. The origins of Jethro Tull can be traced to Blackpool, Lancashire, in 1962, where Ian Anderson formed his first group Blades, which was originally a four piece, featuring Ian Anderson on vocals and harmonica. A year later in 1963, Blades was a quintet and in 1964 the group was a sextet who played blue-eyed soul. However, by 1967 blades decided to spread their wings and head to London. Before that, the nascent band had to settle on a name, and various names were tried, only to be rejected. Then someone at a booking agent christened the band Jethro Tull, after the eighteenth century agriculturist. Little did anyone realise that the newly named Jethro Tull would become one of the biggest bands in the world over the next decade. Not long after becoming Jethro Tull, Ian Anderson acquired his first flute. Up until then, he had played harmonica and was trying to learn to play the guitar. Soon, , Ian Anderson realised that wasn’t a great guitarist, and having realised that the world had enough mediocre guitarists, decided to expand his musical horizons and bought a flute. Little did he realise this would be one of Jethro Tull’s trademarks. After a couple of weeks, Ian Anderson had already picked up the basics of the flute. He was learning as he played. While this wasn’t ideal, it was the only way that possible. Especially with things happening so quickly for Jethro Tull who would soon release their debut single. Sunshine Day was penned by Mick Abrahams, with Derek Lawrence taking charge of production. However, when their debut single was pressed, Jethro Tull realised that an error meant the single was credited to Jethro Toe. To make matters worse, Sunshine Day wasn’t a commercial success and failed to trouble the charts. Despite this disappointment, thing got better when Jethro Tull released their debut album This Was. Recording of This Was took place at Sound Techniques in London, with the sessions beginning on the ‘13th’ of June 1968, and finishing on the ‘23rd’ of August 1968. By then, Jethro Tull had only £1,200 was spent recording their debut album This Was. This money would soon be recouped when This Was released. Prior to the release of Jethro Tull’s debut album This Was critics had their say on the album. The majority of the critics were impressed by This Was which was a fusion of blues rock, R&B and jazz. This pleased Jethro Tull and their management, who decided to launch This Was at the Marquee Club, in London. Jethro Tull was only the third band to launch their debut album at the Marquee Club, and would follow in the footsteps of the Rolling Stones and The Who. Both bands were amongst the biggest bands in the world by 1968, and so would Jethro Tull. On the ‘25th’ October 1968 Jethro Tull released This Was, which reached number ten in the UK. Three months later, Jethro Tull released This Was in America on the ‘3rd’ of February 1969 and it reached sixty-two in the US Billboard 200. This was seen as a success by Island Records in Britain and Reprise in America. Jethro Tull had made inroads into the most lucrative music market in the world. It was a successful start to Jethro Tull’s career, which was about to enter a period where critical acclaim and commercial success were almost ever-present. However, there was a twist in the tale. By then, Mick Abrahams left the band after he and Ian Anderson disagreed over the future direction of Jethro Tull. The sticking point was that Mick Abraham wanted Jethro Tull to stick with blues rock, while Ian Anderson realised there was no real future in blues rock. He wanted to take Jethro Tull to explore a variety of musical genres. As a result, Mick Abrahams left Jethro Tull and was replaced by Michael Barre. Little did either Mick Abraham nor Michael Barre realize that Stand Up marked the start of a period where Jethro Tull would sell over sixty-million albums. With new guitarist Michael Barre onboard, work began on Jethro Tull’s sophomore album Stand Up, which was a much more eclectic album to This Was. Ian Anderson who was now Jethro Tull’s primary songwriter, penned nine of the ten tracks and drew inspiration from everything from blues rock, Celtic, classical, folk and rock. These ten tracks became Stand Up, which was recorded over three months in 1969. Recording of Stand Up took place at Morgan Studios and Olympic Studios. The sessions began on the ‘17th’ of April 1969, and continued through to the ‘21st’ of May 1969. Three months later, and Stand Up was released. Before the release of Stand Up in September 1969, the reviews of Jethro Tull’s sophomore album were positive, with the musicianship and production receiving praise from critics. They also noted that the Jethro Tull’s music was starting to evolve, although Stand Up still featured blues rock sound. Elsewhere on Stand Up, Jethro Tull had started to expand their musical palette and this struck a nerve with critics and record buyers. 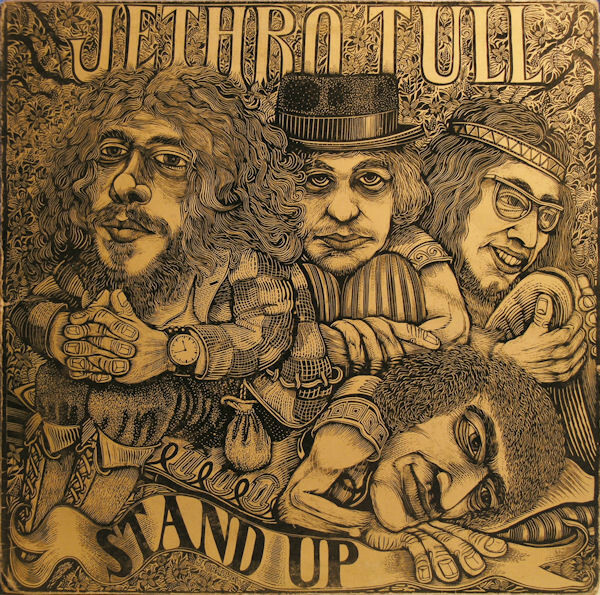 On Stand Up’s release in the UK on the ‘1st’ of August 1969 Jethro Tull’s sophomore album. topped the charts. When Stand Up was released on the ‘29th’ of September 1969 it reached number twenty in the US Billboard 200 Charts and was certified gold. This was the start of a golden period in Jethro Tull’s career. Following the commercial success of Stand Up, Jethro Tull returned to Morgan Studios, in London, on the ‘3rd’ of September 1969 and spent the next five months recording ten new tracks which were penned and produced by Ian Anderson. 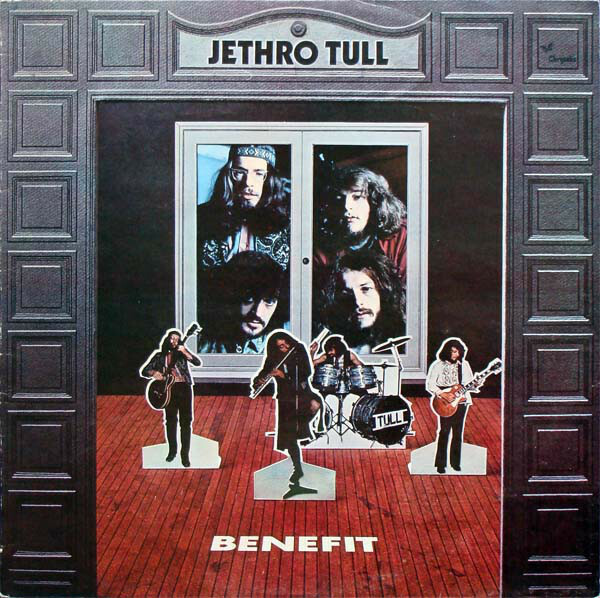 By the ‘25th’ of February 1970 Jethro Tull had completed Benefit, which was much more experimental and darker album and the first album of the progressive rock years. 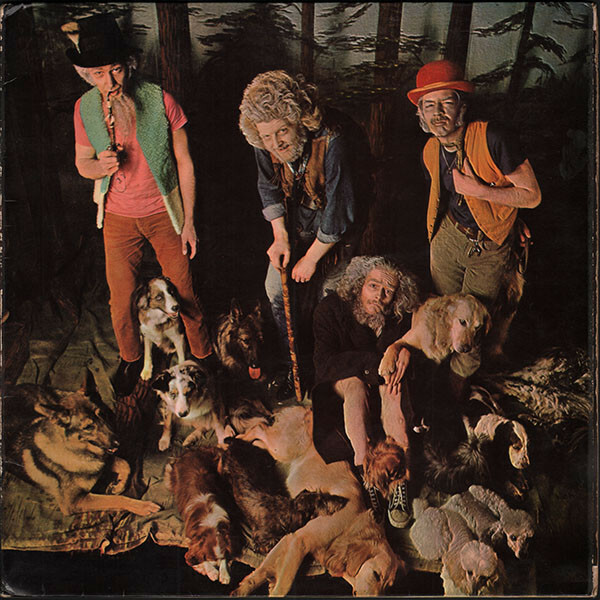 Before the release of Benefit, the critics had their say on Jethro Tull’s third album, which they noted had a much more experimental sound as the band flitted between progressive rock and folk rock. Ian Anderson had allowed Jethro Tull more freedom to express themselves as he also wanted Benefit to have a live sound. This shawn through, as does Benefit’s darker sound which Ian Anderson claimed was because of the pressure of a forthcoming American tour, and his disillusionment with the business side of the music industry. However, the new sound didn’t affect sales. Jethro Tull released Benefit on the ‘20th’ of April 1970, and it reached number three in the UK, and eleven in the US Billboard 200 Charts. Just like Stand Up, Benefit was much more popular stateside than in the UK. It seemed American record buyers “got” Jethro Tull more than their British counterparts. This would the case when Jethro Tull released their first classic album, Aqualung. By December 1970, Jethro Tull had just returned from a gruelling American tour, and were about to head into the studio to record their fourth album Aqualung. This wasn’t ideal, and already, Ian Anderson wasn’t enjoying the months away from home. He missed his friends and family which was one of the downsides of being a member of one of the most successful rock bands in the world. To make matters worse, while his friends and family were readying themselves for the forthcoming festive season, Ian Anderson and the rest of Jethro Tull were about to begin recording their fourth album, and their second progressive rock album, Aqualung. Despite Jethro Tull’s gruelling touring schedule, Ian Anderson’s creativity hadn’t been stifled, and he returned with the lyrics to the band’s most ambitious and cerebral album, Aqualung. It was a concept album that examined ”the distinction between religion and God.” This seemed an unlikely subject for an album, even a seventies concept album. However, Aqualung, which feature two new band members was a game-changer of an album. Joining Jethro Tull arrived at Island Studios in December 1970, where Ian Anderson and Terry Ellis took charge of production were new recruits, keyboardist John Evans and bassist Jeffrey Hammond. Both were looking forward to recording their first album with their new band, which was another album of progressive rock that featured elements of folk rock. Aqualung took until February 1970 to complete, but was worth the wait as it was Jethro Tull’s most cerebral and philosophical album and also their most successful album. Once Aqualung was completed, neither Chrysalis in Britain, nor Reprise in America wasted time in releasing Jethro Tull’s fourth album. Given the subject matter, there must have been a degree of trepidation amongst the executives at both record companies as concept albums were controversial. However, a concept album that examined ”the distinction between religion and God” could prove hugely controversial and there could be a huge backlash against the album given its subject matter. As copies of Aqualung were sent out to critics, executives at Chrysalis and Reprise awaited their reviews with bated breath. They need not have worried as most of the reviews were positive, with critics remarking upon the quality of the music, the standard of the musicianship and Ian Anderson’s thought-provoking and cerebral lyrics. 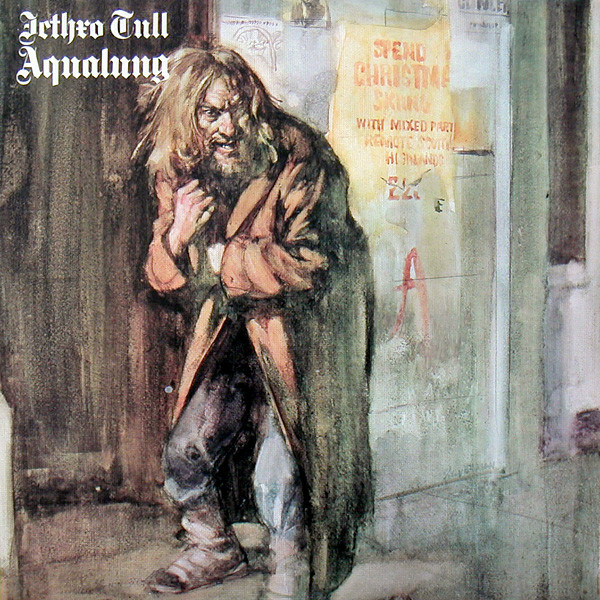 Many critics hailed Aqualung as Jethro Tull’s finest album and a progressive rock classic. Record buyers agreed. On the release of Aqualung on the ‘19th’ of March 1971, it reached number four in the UK. Meanwhile, Aqualung reached seven in the US Billboard 20 and was certified triple platinum in America. Elsewhere, Aqualung reached number five in Germany, and was certified gold and Jethro Tull’s fourth album sold seven million copies worldwide. This transformed Jethro Tull’s fortunes, who now one of the biggest rock bands in the world. For the two new members of Jethro Tull, this must have been hard to take in. Suddenly, they were part of a band who had just sold over seven million albums which must have seemed surreal for the newcomers. Meanwhile, another member of Jethro Tull decided to call it a day after the success of Aqualung. Drummer Clive Bunker had been a member of Jethro Tull since the early days and it wasn’t going to be easy to replace him. He had decided to bow out after Jethro Tull’s most successful album, and must have known that following up Aqualung wasn’t going to be easy. After the commercial success and critical acclaim of Aqualung, critics, record company executives and the record buying public wondered what Ian Anderson had in-store for the fifth Jethro Tull album?As always, it was a case of expect the unexpected. What nobody expected, was that Ian Anderson would pen one lengthy track that took up both sides of Thick Of A Brick. Side one of the original album featured Thick as a Brick Part I, while side two featured Thick as a Brick Part II. This song of two parts comprised Jethro Tull’s latest concept album which was recorded at Morgan Studios, in London during December 1971 and was the first to feature new drummer, Barriemore Barlow. Following critics conclusion that Aqualung was a “concept album,” Ian Anderson decided to have some fun at the critic’s expense. He decided to “come up with something that really is the mother of all concept albums.” Among his influences were Monty Python and the movie Airplane. Just like Airplane poked fun at the cinema goers, filmmakers and critics, Thick Of A Brick saw Jethro Tull poke fun at their audience and music critics. However, Jethro Tull weren’t laughing at their audience, they were laughing with them and maybe, were laughing at other groups. Thick As A Brick was recorded in a day. It was meant to be an adaptation of an epic poem written by a fictional eight year old prodigy, Gerald Bostock. Ian Anderson even went as far as giving the fictional Gerald Bostock a co-credit. The poem was meant to be pseudo Homeric, but with a bombastic, humorous style. The album came wrapped in a cover that replicates a comedic newspaper and features the poem penned by the child prodigy. Although Thick As A Brick’s album cover and the album had spoof written all over it, many people didn’t get Jethro Tull, or more specifically, Ian Anderson’s unique style of humour. It was way too subtle. With Thick As A Brick complete, and the fictional Gerald Bostock’s epic poem brought to life, copies of the album were sent out to critics. They hailed the album one of Jethro Tull’s finest. The music on Thick As A Brick was groundbreaking, innovative, slick and sophisticated. Most critics were won over by music that was complicated, but tinged with subtle humour. Incredibly, some critics failed to find the funny side of Thick As A Brick, and bought it hook, line and sinker. They failed to see that Jethro Tull were poking fun at the concept album, and laughing along with their audience at what Ian Anderson perceived as its pomposity. However, what very few critics overlooked was Jethro Tull’s first true progressive rock offering. Thick As A Brick marked the completion of Jethro Tull’s move towards progressive rock which they had toyed with on their two previous albums. On Thick As A Brick they embraced progressive rock fully, on album which featured numerous musical themes, changes in time signature and tempo shifts. This proved popular with their legion of fans. When Thick As A Brick was released on the ‘10th’ of March 1972 it reached number one in Australia, Canada and the US Billboard 200 charts. Back home in Britain, Thick As A Brick reached number thirteen which wasn’t unlucky for Jethro Tull. 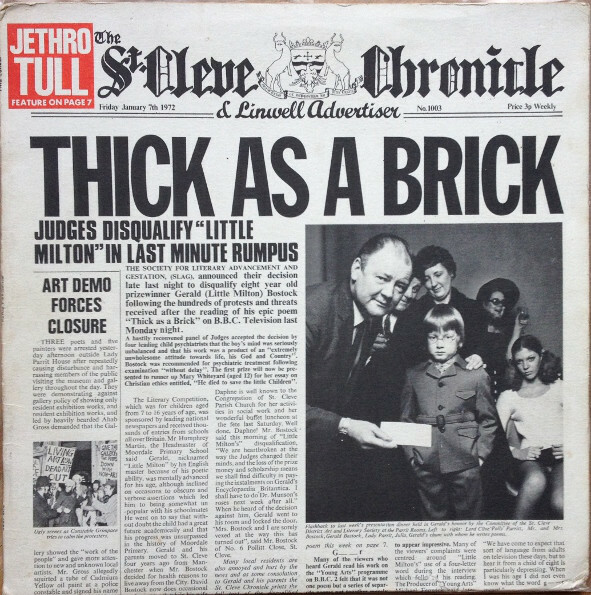 Thick As A Brick proved to be Jethro Tull’s most popular album in Britain and was certified silver. Meanwhile Thick As A Brick was certified gold in America and Ian Anderson’s parodic concept album saw Jethro Tull triumph again, as they became progressive rock pioneers. In March 1973, Jethro Tull returned to Morgan Studios, where they began work on their sixth album A Passion Play. It was another concept album where individual songs were arranged into a single continuous piece of music that followed the progress of the spiritual journey of Ronnie Pilgrim in the afterlife. Just like Aqualung, it was an ambitious and innovative album that was cerebral and through-provoking. By the time work began on A Passion Play, the members of Jethro Tull were contemplating moving to France to escape the punitive tax rates that were imposed on high earners like rock stars. Jethro Tull had even identified the Château d’Hérouville as a potential venue to record A Passion Play which was meant to be a double album. Eventually, Jethro Tull had only enough material for three sides of the double album, and they decided that A Passion Play should be a single album. One of the tracks, The Story of the Hare Who Lost His Spectacles seems to have been inspired by Prokofiev’s Peter and The Wolf, while other parts of A Passion Play are reminiscent of to T.S. Eliot’s The Waste Land and John Milton’s A Passion Play, as Jethro Tull decided to head further down the road marked progressive rock. However, they also incorporated elements of traditional English folk music and played an array of disparate instruments on A Passion Play which was scheduled for release in July 1973. Prior to the release of A Passion Play, critics had their say on Jethro Tull’s sixth album, but the majority of reviews were highly critical of the album. Although none of the critics were won over by A Passion Play, but record buyers were. Despite the poor reviews, A Passion Play still reached thirteen in the UK on its release on the ‘13th’ of July 1973 and was certified silver. 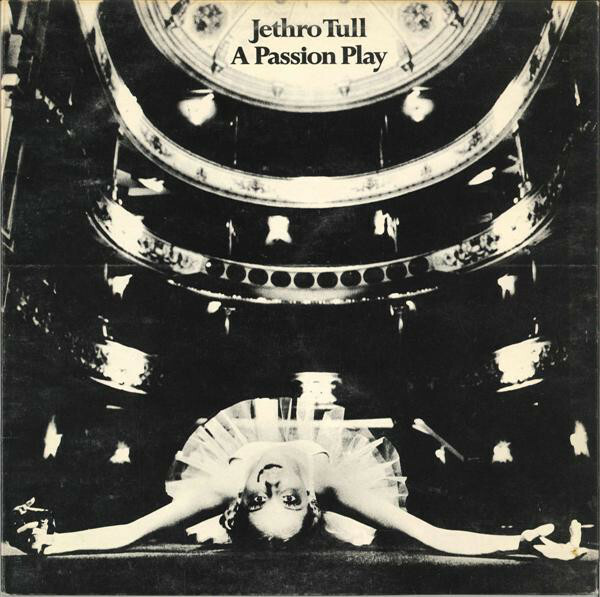 Ten days later, A Passion Play was released in North America on the ‘23rd’ of July 1973 and reached number one in Canada and the US Billboard 200 and was certified gold. Jethro Tull had triumphed over adversity for Jethro Tull, and had now old in excess of five million albums in America alone. Following the criticism of A Passion Play, it looked as like the end of the road for Jethro Tull, and it was rumoured that Ian Anderson was going to disband the group. 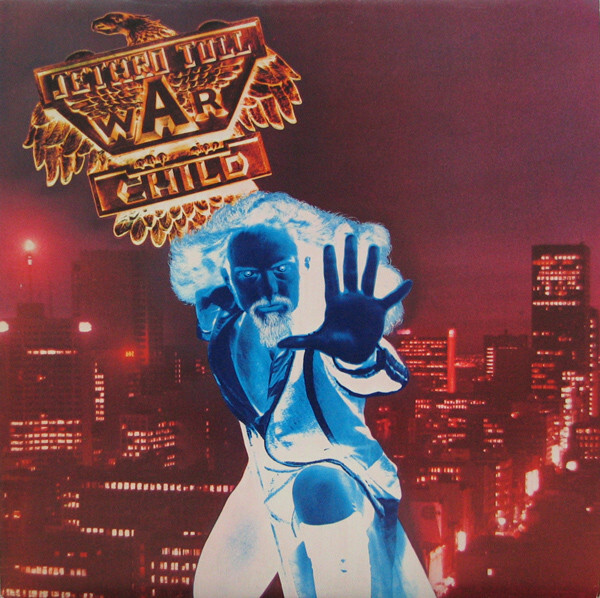 However, eventually, Jethro Tull returned in October 1974 with a new album War Child. Some of the tracks that hadn’t been used on Aqualung and A Passion Play resurfaced on War Child, which had been recorded in Morgan Studios, London, and in the Château d’Hérouville. Despite the poor reviews of A Passion Play, it was a much more relaxed Jethro Tull that recorded the new tracks at Château d’Hérouville that would feature on War Child. It was meant to be a double album that accompanied a film project The War Child, which was described as a metaphysical black comedy based on a teenage girl in the afterlife, who meeting characters based on God, St. Peter and Lucifer who were portrayed as shrewd businessmen. However, the film was abandoned after failing to find a major movie studio willing to finance it. This left just War Child. When War Child was finished, it followed in the footsteps of A Passion Play, and was another album of orchestrated album of progressive rock that sometimes, headed in the direction of a more traditional rock sound. However, just like A Passion Play, critics disliked War Child, and wrote scathing reviews of the album. No longer were Jethro Tull the darlings of the critics. Despite that, War Child was released on the ’14th’ of October 1974, and reached fourteen in the UK and two on the US Billboard 200. This was enough for another gold disc for Jethro Tull, who knew that they needed to change tack for their next album. By the time Jethro Tull began work on their eighth album Minstrel In The Gallery, they were one of the biggest selling groups of the seventies. However, this came at a cost to songwriter-in-chief and lead vocalist, and the constant cycle recording an album and then touring it, had cost him his marriage. Commercial success and critical acclaim had come at cost, by April 1975, Ian Anderson’s marriage to Jennie Franks had ended in divorce. It wasn’t a good time for the Jethro Tull frontman. When Ian Anderson began work on what became Minstrel In The Gallery, it proved a cathartic experience, he wrote about his divorce, and the pressures of having to constantly, write, record and tour. These songs were recorded between the ‘5th’ of May 1975 and the ‘7th’ of June 1975 at Maison Rouge Mobile Studio, in Monaco. Ian Anderson had brought onboard a string quartet, to replace the orchestra that featured on the two previous albums. This he hoped would help transform Jethro Tull’s fortunes. Once Minstrel In The Gallery was completed, it was scheduled for release in September 1975. Before that, the critics had their say. The reviews of Minstrel In The Gallery were hardly glowing and some critics slated the album. Rolling Stone’s unnamed critic didn’t hold back. Their review called Minstrel In The Gallery “instantly forgettable.” However, Rolling Stone weren’t alone, and only a few reviews were favourable and the majority of the reviews were mixed. No longer was Jethro Tull’s fusion of progressive rock, folk rock and hard rock as popular amongst the critics. It was a different case with the record buying public, who had the final say. 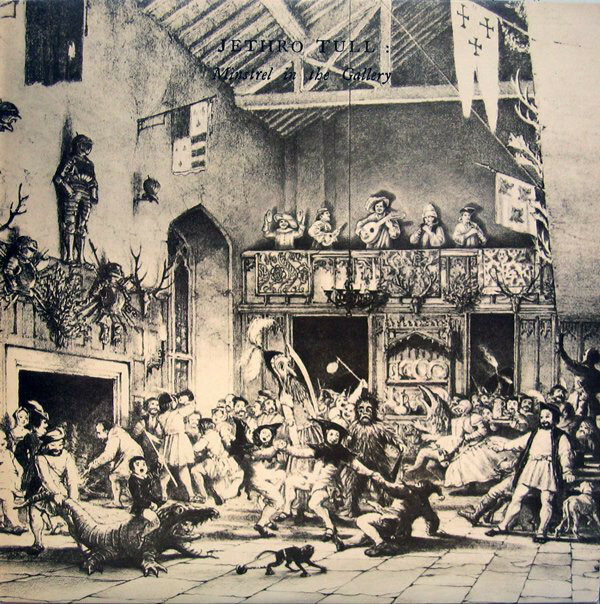 On its release in Britain on the ‘5th’ of September 1975, Minstrel In The Gallery reached number twenty and was certified sliver. Three days later, Minstrel In The Gallery was released on the ‘8th’ of September 1975 and reached number two in the US Billboard 200, and was certified gold. Meanwhile, in Austria, Germany, Norway and Sweden, Minstrel In The Gallery sold well and Jethro Tull were still one of the biggest bands of the seventies, thanks to Minstrel In The Gallery. After the gruelling Minstrels In The Gallery tour, bassist Jeffrey Hammond was exhausted. Life with Jethro Tull seemed to be a schedule of record an album, then tour the album. It was non-stop and Jeffrey Hammond wanted to slow down, so, after the Minstrels In The Gallery tour, he announced he was leaving to become an artist. For Jethro Tull, this presented a problem, as they were about to record their ninth album Too Old to Rock ‘n’ Roll: Too Young to Die! Fortunately, John Glascock was recruited and joined Jethro Tull just in time to record their latest concept album Too Old To Rock ‘n’ Roll: Too Young To Die! at Radio Monte Carlo, using the Maison Rouge Mobile Studio. This wasn’t the same studio that Jethro Tull had used to record Minstrels In The Gallery. However, Too Old to Rock ‘n’ Roll: Too Young to Die! which was recorded between the ’19th’ of November 1975 and the ’27th’ of January 1976 was a very different album to its predecessor. Too Old To Rock ‘n’ Roll: Too Young To Die! told the story of Ray Lomas, an ageing rock star, who had retired from music, when the music he played fell out of fashion. Still, Ray Lomas was a greaser who wasn’t going to have a makeover. Not even when he went onto the “Quizz” show and won the jackpot. Even money however, didn’t bring Ray Lomas happiness. After winning the money, Ray Lomas tries to commit suicide, and like the Sleeping Beauty, he falls into a deep sleep. When Ray Lomas wakes up, the greaser fashion is back in style, and he makes a comeback. Never did he lose faith that his style would come back into fashion. This was the story that Too Old To Rock ’N’ Roll: To Young To Die was attempting to tell and which featured on cartoon printed on the album cover. However, not everyone was impressed by Jethro Tull’s latest concept album. Critics on hearing Too Old To Rock ’N’ Roll: To Young To Die weren’t impressed with the album, and felt that the plot lacked clarity and Ian Anderson may have been a gifted lyricist, but wasn’t a storyteller. The reviews of Too Old To Rock ’N’ Roll: To Young To Die ranged from poor to mixed, but not all of these reviews were an honest reflection on the music on the album. The rise of punk, which was the antithesis to progressive rock, resulted in groups like Jethro Tull being labelled musical dinosaurs by a new breed of gunslinger critics. They perceived Jethro Tull as remnants of the music’s past and slated their albums. This affected sales of Too Old To Rock ’N’ Roll: To Young To Die. When Too Old To Rock ’N’ Roll: To Young To Die was released on the ’23rd’ of April 1976, it stalled at fifteen in the UK. 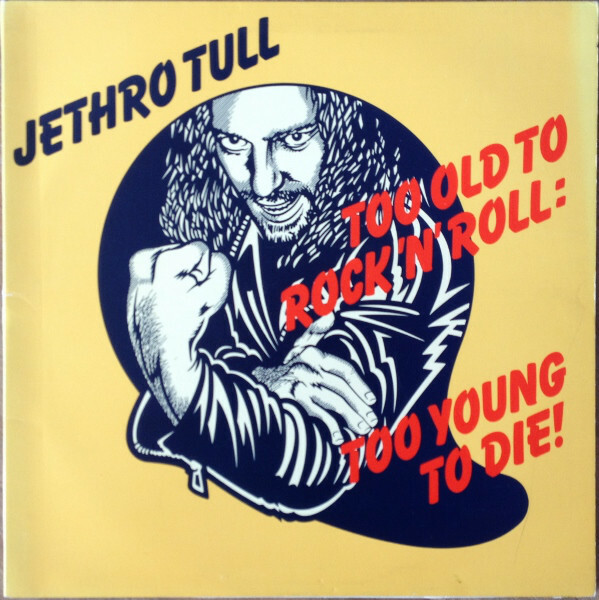 Three weeks later, on the ’17th’ of May 1976 Too Old To Rock ’N’ Roll: To Young To Die reached number fourteen in the US Billboard 200, and this time there was no gold disc for Jethro Tull. By then, Jethro Tull realised that they had to change direction and soon, the folk rock years would begin. Following the disappointment of Too Old To Rock N’ Roll: Too Young To Die, Jethro Tull decided to reinvent their music and move in the direction of folk rock. This new era began at Morgan Studios, in London where between September and November 1976 Jethro Tull recorded the nine songs that became Songs From The Wood. It’s an album that is rich in imagery from medieval Britain, while Folklore, Myths and Legends of Britain seems to have inspired Ian Anderson as he wrote Songs From The Wood. Songs Jack-In-The Green, Cup Of Wonder and Ring Out Solstice Bells are full of medieval imagery and transport the listener back in time to another time and another place. Meanwhile, Velvet Green and Fire At Midnight showcase what’s best described as an ornamental folk arrangements while Pibroch (Cap in Hand) has a much more experimental sound. However, despite the strong folk influence on Songs From The Wood, Ian Anderson was quick to dismiss this description as irrelevant, and instead saw the album as Jethro Tull reaffirming their British identity. 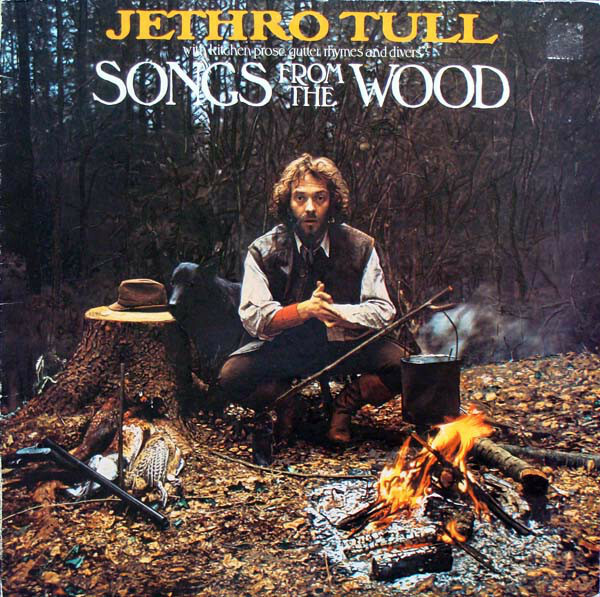 With Songs From The Wood complete, critics had their say on Jethro Tull’s first folk rock album. The majority of the albums were positive, and this made a change from recent Jethro Tull albums which had been slated by critics. It looked as if their luck was changing. When Songs From The Wood was released on ’4th’ of February 1977, it reached number twenty in the UK and eight in the US Billboard 200. This was enough for gold discs on both sides of the Atlantic, as Jethro Tull announced their return with Songs From The Wood which marked the start of the folk rock years. Buoyed by the success of Songs From The Wood, Jethro Tull began work on their second folk rock album, Heavy Horses. Although Ian Anderson was still Jethro Tull’s songwriter-in-chief Martin Barre and David Palmer who both contributed to Heavy Horses. Mostly, though, Heavy Horses was an album written by Ian Anderson and which featured telluric, imaginative and esoteric themes than those that feature on Songs From The Wood. Journey Man saw Ian Anderson writing about how humans have to conform each and every day of their life. On a lighter note, Rover was dedicated to Ian Anderson’s dog and …And the Mouse Police Never Sleeps for his cat and No Lullaby was written for his young son, James. However, other songs found Ian Anderson contemplating the ever-changing and disappearing world which prove poignant and powerful. Meanwhile, Acres Wild and Weathercock find Ian Anderson hoping and pleading that better days are ahead for planet earth. 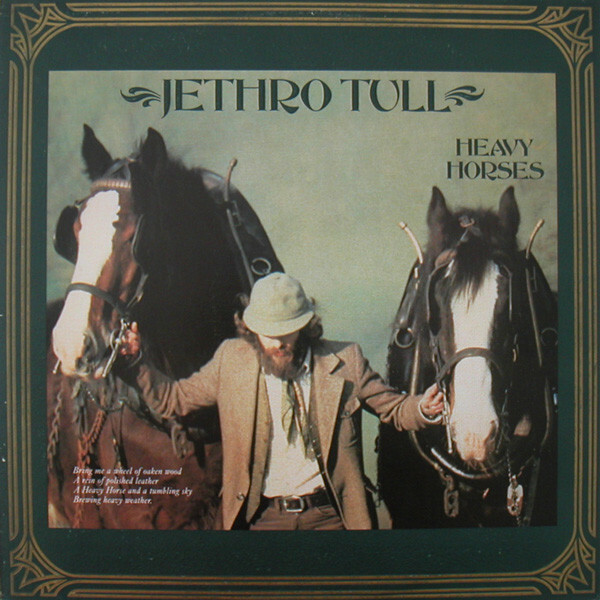 Then there’s Heavy Horse, which is the second of two complicated suites that is comparable to the music on Aqualung, as it progresses from a piano led ballad to the galloping arrangement which Ian Anderson knew that the older and more experienced lineup of Jethro Tull would cope with admirably as they began recording their eleventh album in May 1977. This time, Maison Rouge Studio, in Fulham, London, was where Jethro Tull recorded their much-anticipated eleventh album Heavy Horses between May 1977 and January 1978. By then, Jethro Tull’s rhythm section featured drummer and percussionist Barriemore Barlow, bassist John Glascock and guitarist Martin Barre. John Evan played piano and organ while David Palmer played pipe organ, keyboards and took charge of the orchestral arrangements. Ian Anderson played flute, mandolin, acoustic and occasionally electric guitar. Augmenting Jethro Tull was Curved Air violinist Darryl Way who featured on Acres Wild and Heavy Horses. He played his part on what was another carefully crafted, cerebral and thought-provoking album. With Heavy Horses completed, critics were keen to hear the followup to Songs From The Wood, and were pleasantly surprised to hear Jethro Tull at their tightest for many years rocking hard on an album of folk rock that sometimes headed in the direction of progressive rock. It seemed that progressive rock wasn’t in Jethro Tull’s past despite their recent reinvention as a folk rock band. However, Jethro Tull unlike many of their contemporaries weren’t willing to embrace punk and post punk in an attempt to win back listeners. Instead, Jethro Tull stuck to their guns, and recorded Heavy Horses which was the folk rock album they had always intended to record. Granted, it was a harder rocking album and much more progressive album than Songs From The Wood, and won that found favour with critics. Just like Songs From The Wood, critics lavished praise and critical acclaim on Heavy Horses and especially the instrumental arrangements, esoteric, cerebral and thought-provoking lyrics and when Jethro Tull decided to kick loose and rock hard. However, winning over critics was only half the battle, and Jethro Tull had still to win over record buyers with Heavy Horses. They need not have worried, because when Heavy Horses was released on the ’10th’ of April 1978, it reached twenty in the and nineteen in the US Billboard 200. This was enough for a silver disc in the UK and a gold disc in America. However, that wasn’t the end of the story of Heavy Horses which was also certified gold in Canada. Record buyers just like critics in Britain and North America had been won over by Jethro Tull’s latest folk rock album. That album, Heavy Horses, has just celebrated the fortieth anniversary of its release with the release of a lavish and lovingly curated five disc set which comes complete with ninety-six page booklet where Ian Anderson documents the recordings on the five diss within the 40th Anniversary New Shoes Deluxe Edition. On disc one of 40th Anniversary New Shoes Deluxe Edition Steven Wilson stereo remix of Heavy Horses, and nine previously unreleased tracks. This includes two takes of Living In These Hard Times and Botanic Man plus versions of Everything In Our Lives, Quatrain and Beltane which are welcome additions. The second and third disc features the Jakko Jakszyk stereo mix of Live in Concert: Berne, Switzerland, May 1978, where Jethro Tull roll back the years, putting all their years of experience to good use as they showcase their talent and versatility. Heavy Horses which was the second of Jethro Tull’s folk rock trilogy, continues where Songs From The Wood left off, and finds Ian Anderson continuing their return to form. They were once again enjoying commercial success and critical success and had now sold in excess of seven million albums in America along. Jethro Tull had come a long way since their early days as a blues rock band, and were still one of the most successful British bands of the seventies. Ironically, Jethro Tull was still more popular in America than in Britain, where record buyers never seemed to ‘get’ their music. That was the case during their progressive rock years, and also when they reinvented themselves as a folk rock group. 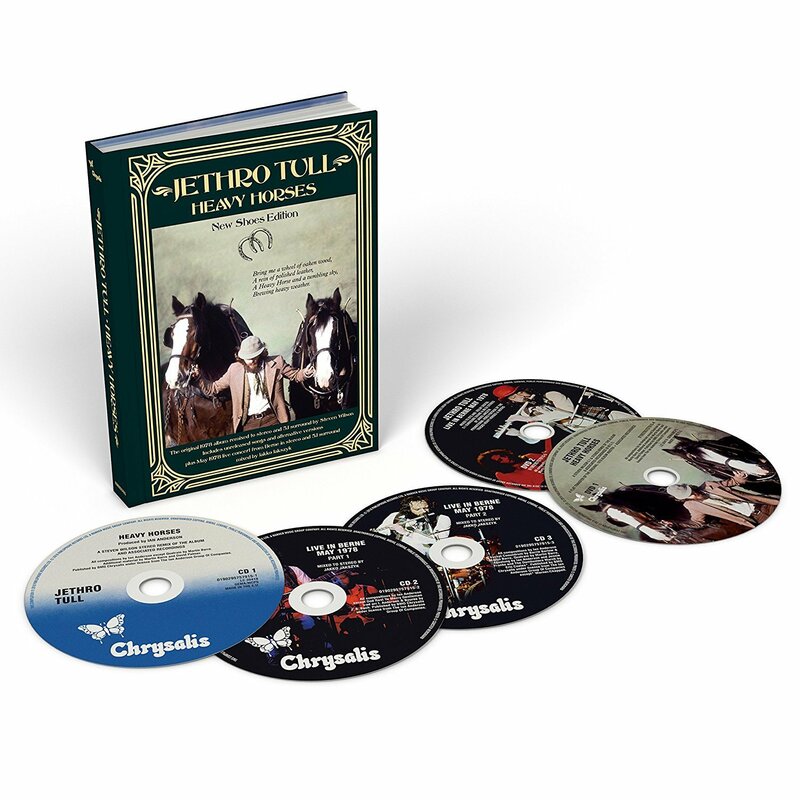 This began with Songs From The Wood which was reissued as a five disc box set in 2017, and the much-anticipated followup Heavy Horses, which documents the next chapter in Jethro Tull’s years. Heavy Horses is another carefully crafted, cerebral and thought-provoking folk rock album which is also progressive and features Jethro Tull at their hard rocking best.